My family enjoyed the pleasure of sampling the delicious chocolates of the Madelaine Chocolate company and were delighted by the fun seasonal themed chocolate novelties. We were pleased to discover that the Madelaine Chocolate Company offers a full range of chocolate treats and gifts, both for all major holidays, as well as for everyday occasions. With the gift-giving season nearly upon us, I was delighted to discover these adorable holiday tins, filled with a generous portion of gourmet chocolates. Festive and fun, filled with either Milk Chocolate Truffle Santa Gift Pail and White Chocolate Truffle Snowman Pail are ready gifts, perfect for a variety of recipients, from teachers, neighbors, the children's friends and certainly as a special treat from Santa! With a great number of gifts to purchase each holiday season, I appreciate that these tins are ready to gift and immediately appealing. Explore the Christmas and Chanukah collections from Madelaine Chocolate Company and find a retailer near you to add ease to you holiday shopping and a tasteful twist to your gift giving this season. If my family's appreciation of Madelaine Chocolate is any indication, you are certain to be very pleased! 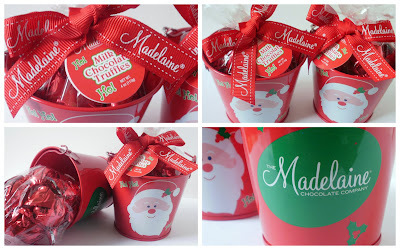 Read our personal review of Madelaine Chocolate! Madelaine Chocolate is generously offering That's What She Said readers an opportunity to win a set of delicious holiday chocolate gift tins, as shown below! This giveaway is open to residents of the US, 18+ and will end on Thursday, December 06, 2012 at 11:59pm EST. Winner will be selected randomly from all eligible entries. Winner will be notified by email and will have 48 hours to respond before an alternative winner is chosen. If you email address is not available through your comment name, please leave it in your entry comment in anti spam format. Visit the Madelaine Chocolate Company website and tell me in a comment below which chocolate offerings you would love to serve to your guests this holiday season and why! 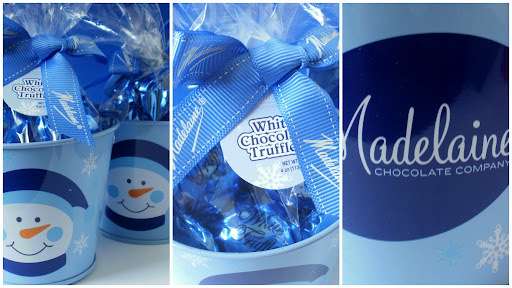 *Share which Madelaine Chocolate gifts would be perfect for someone on your list and why in a comment here, 1 entry. I received delicious Madelaine Chocolate to explore for the purposes of creating this feature. The opinions above are both honest and of my own experiences. Sponsor is responsible for supplying and shipping prize. Facebook, Pinterest and Google+ are not involved in nor responsible for this giveaway in any fashion. the Teddy Bears and Mini Fish! The 'A Star is Born" Madelaine chocolates would be perfect for a friend who just had a baby! I am known for my nutcracker collection and the soldiers on my Christmas tree and this would add to the theme. The milk chocolate malted balls would be perfect for my husband. He loves Chocolate and malt so great combination. I would love to serve my guest this christmas the "mini santas" chocolate! Would love to serve the Snowman Oval Pops because they are easy to eat, not messy, and fun for the kids! The Christmas Presents in Mesh Bag would be great for my grandson because he would be excited that each chocolate is wrapped up like a present! I would love to serve my guests the Christmas Mint Truffles! I Liked Tsue ~ That's What She Said on Facebook. I would love to serve my guests the Sleigh with Presents GIft Box ~ these would make great displays as a centerpiece or by a door when guests leave...they can leave with some sweet treasures to remind them of a wonderful visit. I'd love the Solid Milk Chocolate Butterflies. fall leaves as they are adorable. I'm all about their white milk chocolate malt balls because we always do a white and silver themed holiday party. I would love to give my guests the mini chocolate santas as a fun reminder of the holiday season. Chocolate Bee's...lol Anything chocolate and I am happy to be honest. Chocolate truffles are amazing though...great now I am hungry. I'd like to have some of their Everyday Presents chocolates. I like on Madelaine Chocolate on Facebook. I entered your Shabby Apple gift certificate giveaway. I commented on your Western Footwear With Fab Flair ~ @Langstons Collections For Women post. I follow That's What She Said on Google+. I think that their chocolate coins would make a great Christmas stocking stuffer for my husband. I like Madelaine Chocolate on Facebook as Kiara Auston. The carmel filled little snowman balls would be a perfect treat! My son would love the village toy shop countdown calendar. I would serve my guests the Christmas Mint Truffles because everyone loves the combination of mint and chocolate. I love the chocolate fall leaves for Thanksgiving. So cute! Carmel filled snowballs...they appear festive and tasty. Give me High Cocoa Dark Chocolate Cranberries. I would serve the dark chocolate Christmas ball mix because my family loves dark chocolate! I follow you with Google+! The Crisp Chocolate Balls would be a perfect Christmas gift for my sister because she's a chocoholic and loves Kit Kats so I think this would be similar to that and Whoppers! I would serve the Caramel Filled Ball Ornaments! They look delicious! Christmas Balls in Mesh Bag would be great for party favors at my christmas party. Christmas Delights would be a great gift for my friend because he is an avid Christmas decorator. I would love to have the Santa Cylinder to give to my granddaughter. She would love it! I would share the malted milk chocolates...YUMMY! I like the stars and stripes gift bag. Thanks so much for the fantastic giveaway! I Like on Madelaine Chocolate on Facebook! Thanks so much for the fantastic giveaway! I Like That's What She Said on Facebook! Thanks so much for the fantastic giveaway! I Follow That's What She Said on Google+. Thanks so much for the fantastic giveaway! I would love to serve the Peanut Butter Filled Mini Santas at my Holiday get-togethers. They are adorable and my family loves peanut butter. I would serve the white chocolate pail with the snowman. It is so cute! i would love to give and serve the VILLAGE TOY SHOP COUNTDOWN CALENDAR to my kids this Christmas season because it will be a great holiday excitement builder and a wonderful chocolate treat for them. THe Christmas mint truffles would be nice. Following you on Google+ as Sarah M.
The bumblebee gift set would be great for my friend Jill befause she collected bee-related stuff (and like chocolate, too). The Santa’s Chocolate Factory Countdown Calendar would be a perfect gift for my nephew. I think the caramel Filled Mini Snowmen look delicious and adorable. I liked Madelaine Chocolate on Facebook. I like the SNOWFLAKE ORNAMENTS because they could be used for decorating and then eaten! The Crisp Christmas balls look great, and they sound great. I would use the Christmas Pops as stocking stuffers for grandchildren. I would like to surve my guests the 1oz turkeys cause there so cute. The mint truffles would be a good gift for my daughter at any time, since she loves them and they can be wrapped in a multitude of designed foils. I would love to have the gold domes in milk chocolate. I would like to give out the mini santa chocolates. I like Madelaine Chocolate on Facebook as Lyndsey Rullman. I like That's What She Said on FB as Lyndsey Rullman. The Christmas Mint Truffle Gift Box because everyone loves chocolate! I would serve the Christmas Chocolate bells to guests this Christmas season because they would look so cute in all my candy dishes. I like That's What She Said on FB as Nicole Lancaster. I like Madelaine Chocolate on FB as Nicole Lancaster. I followed you on Google+1 as Nicole Lancaster. The chocolate angel orderments would be a prefect gift for everyone on my Chistmas list as I could use them on top of everyone's gift. Milk Chocolate Malt Balls Gift Bag because I love them and so will others. My sister would like the 6 oz. Santa. I'd love to serve the Bumble Bees! I would like to serve the 1 ounce Santa and the 1 ounce Mrs. Santa Claus. Everyone loves chocolate, and I think the small children would enjoy these. I'd like to get the Village Toy Shop Countdown Calendar for my kids. They are older but it isn't Christmas to them without one of these! I like The Madelaine Chocolate Company on FB as Wendy R.
I am a fan of Tsue ~ That's What She Said on FB as Wendy R.
The Milk Chocolate Gold Satin Heart Signature Box would be perfect for my husband - perfect to give to the one you love! I would like to serve them the Christmas mint truffles. Dark Chocolate Malt Balls because i've never had those before. Christmas Mint Truffle Gift Box because everyone would love it. I like Madeline Chocolate on Facebook. I'm a huge soccer fan and everyone would love the Soccer Balls in Mesh Bag - 418-2. Would love to give out the Mini soldiers this holiday! !